Many youth are not given the chance, due to the lack of three fundamental needs; ACCESS, RESOURCES and FUNDING. Join us in helping bridge that gap. http://22foundation.com/wp-content/uploads/22nd-Foundation-Columbus-Ohio.png 0 0 BobbyFerguson http://22foundation.com/wp-content/uploads/22nd-Foundation-Columbus-Ohio.png BobbyFerguson2014-11-05 12:16:232014-11-06 16:49:1422nd Foundation Release New Promotional Video "EVERY CHILD"
22nd Foundation and A&L Afterschool Literacy+ Institue launched a summer 2014 tennis camp program at Bretnell Recreation. Twice a week the 22nd Foundation will hold tennis instruction classes for recreation and playground kids. The program will run until the end of July. Youth will have the opportunity to learn the fundamentals of tennis, importance of childhood obesity, receive a free snack, and play a game that will teach them values in life. Devin Boyer wins 3rd place boys singles def. 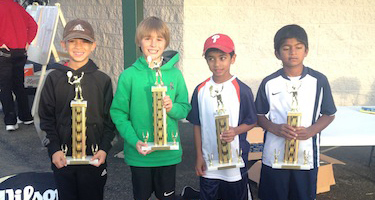 Ajay Mathenthiran 6-2 6-1, Devin also won 1st place singles with doubles partner Griffin Biernat 8-2 in the finals. Sydni Ratliff took 1st place in singles def. Elizabeth Pendergast 7-6(4),6-1, Sydni also won 1st place doubles with partner Paige Herremans 8-5 in the finals.